McCormick Cilantro is the leaf of a hardy herb, Coriandrum sativum, the seed of which is coriander seed. The seed and the leaves have decidedly different tastes and are used in quite different foods. Coriander Seed is one of the principle ingredients in Curry Powder. Coriander Leaves are known in the US as Cilantro Leaves. The name Cilantro comes from the Spanish name for the Coriander plant. Cilantro should always be added to cooked foods at the end of cooking, as heat will destroy the flavor. Cilantro Leaves are used in Asian cooking, as well as in Mexican foods such as Spanish rice, salsas and guacamole. It's taste is similar to parsley, but has a little more tang to it. 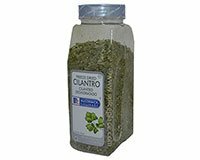 This is a large foodservice package container of dried Cilantro Leaves. Ingredients: Freeze Dried Cilantro Leaves. Crab with Peppers and Corn Skillet More Recipes..